The carcass of a seven year old male tiger with paws missing has been found in the Katangi area of Balaghat district. A part of its skin has also been taken away by the poachers. This is the 26th tiger death in the state this year. Chief conservator of forests (CCF) Dhirendra Bhargava told HT that carcass was decomposed and seemed around ten days old. “Its four paws and some skin was missing. We have started investigation into case. After post mortem , the last rites of the tiger were performed. The exact cause of its death will be known after the post mortem results come”, he said. On whether the tiger had come from Kanha or Pench tiger reserve, he said Kanha was far from the area and Panch is over 20 kms far. “At present I cant say from where the tiger had come . It could have been roaming in this area or may be it had come from Pench tiger reserve”, he said. He further added that a dog squad had been brought into the Katangi area to investigate the matter. Three tiger reserves-Kanha, Pench and Bandhavgarh-are witnessing tiger mortality in an unprecedented manner. This is the fifth tiger death in the state in last two months. On September 29, a one-year-old tigress died in Pench Tiger Reserve’s buffer area due to starvation. The tigress had died due to poor hunting skills. Then on October 22, carcass of another six to eight year old male tiger was found in Khatiya range of Kanha Tiger Reserve, with its four paws missing. The tiger had died due to electrocution. Then on October 28, carcass of another male tiger was found in Kanha Tiger Reserve. 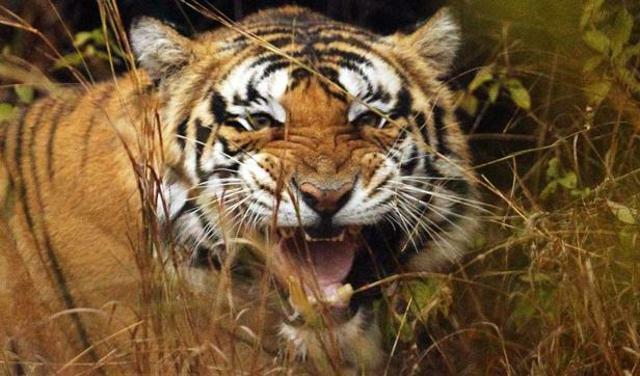 Earlier this month, a 7-year-old male tiger’s carcass was found in Bandhavgarh Tiger Reserve’s Panpatha area. The tiger was electrocuted. The officials of the state forest department later arrested the poachers who had laid the live wire for poaching.